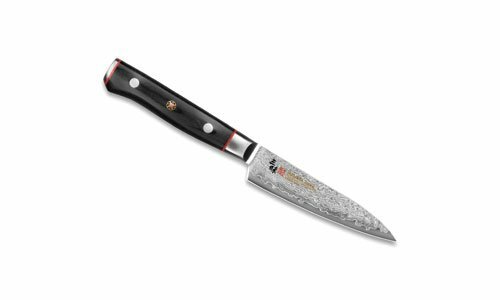 The Mcusta Zanmai Classic Utility Knife is one of the most frequently used knives in the kitchen, designed for cutting and slicing slightly larger items. Zanmai Classic features a beautiful 33-layer Damascus design, encased with a high quality 'super steel' VG-10 core for ultimate sharpness and long lasting edge retention. 60-61 Rockwell blades display hardness, toughness, and flexibility. The 9-12° blade angle is finished in Zanmai's perfect Hamaguri V-Cut form, making it incredibly sharp and the ideal structure to cut food effortlessly. The black pakkawood handle is triple-riveted and accented with red spacers and a traditional Japanese decorative pin. Handcrafted in Seki city, Japan. If you have any questions about this product by Mcusta Zanmai, contact us by completing and submitting the form below. If you are looking for a specif part number, please include it with your message.